Tired of colouring your roots every 4-6 weeks? No problem! We have the perfect solution for you — root melt! A root melt is a technique used to blend darker roots into the rest of the hair, blurring out any lines of demarcation. What we typically do is pick a shade close to your natural hair colour, smudging it into the lightened/coloured hair. While your roots grow out, it will create a seamless natural blend between the dark to light hair. This can extend your colour (and time in salon) by up to 3-4 months! Wha?? Yup, you heard that right. This look is great on blondes, balayage, highlighted, and even grey hair. So stop dreading over those harsh roots and instead enjoy the grow out period! 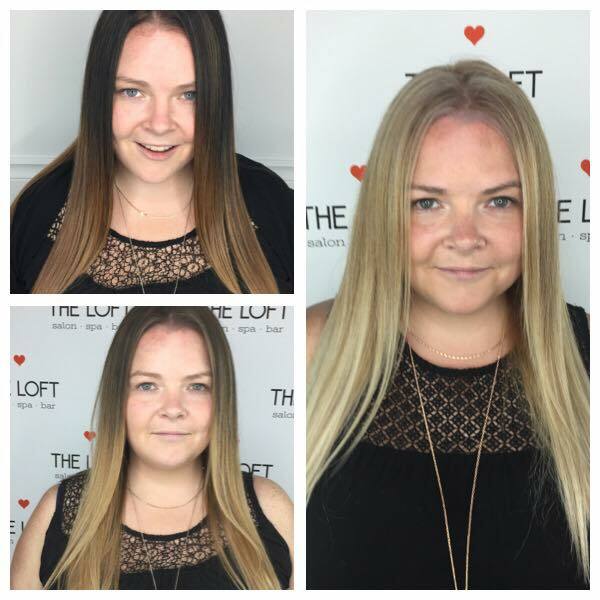 Reanne is a hair stylist at The Loft Salon • Spa • Bar in Winnipeg. Need a quick and pretty style for an upcoming wedding or event? Try this easy braided flower, demonstarted by Selene. Curly hair can be unruly, wild and hard to tame but here are a couple tips to help you out when styling your curls. Ever feel like you’re LITERALLY grasping at straws whenever you touch your hair? The Loft Charity Pop-up Salon at The Forks! The Loft Salon • Spa • Bar is excited to announce our charity pop-up at The Forks! The Loft stylists will be doing braids, up styles, touch-ups and bouncing curls in support of The Forks Tower of Toys. We will be set up at The Forks Market in a pop-up shop on the 2nd floor starting Thursday, December 1 for Holiday Bazaar Night and continuing until December 14. In exchange for our services, we ask that our guests make a donation of either a new, unwrapped toy or cash to The Forks Tower of Toys to help make Christmas brighter for kids in Winnipeg. We're in good company too! Winnipeg's famous handmade market, Third + Bird will also be setting up vendors on the 2nd floor!